I'm looking for comparable depictions of the diadem that became very prominent in the eighteenth and nineteenth dynasties. The ssd headband was depicted as early as the fifth dynasty, but the ornate version that was depicted on reliefs of Amenhotep3, Nefertiti, Tutankhamen and royals of the eighteenth dynasty is singular. 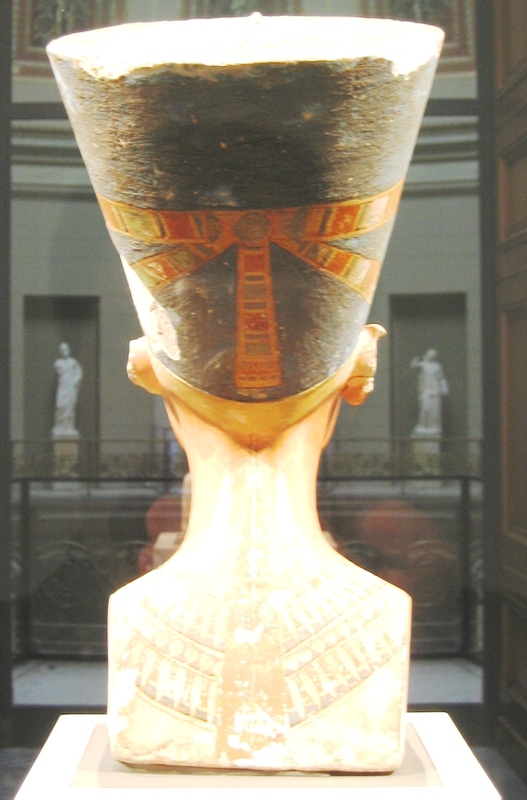 The actual diadem that was found upon the body of Tutankhamen almost perfectly matches the painted band on the crown of the bust of Nefertiti. 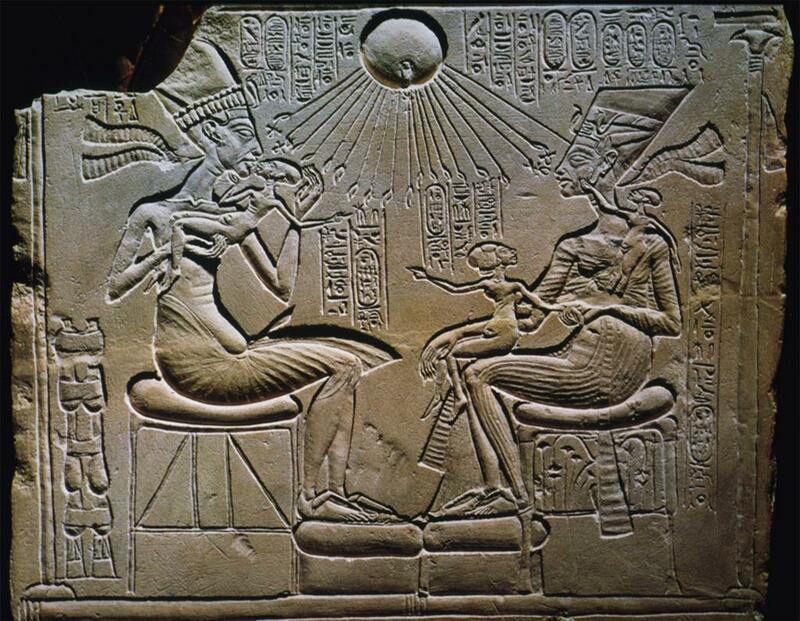 Was it depicted in that elaborate form earlier than the eighteenth dynasty? Bettina Bader : Disc-Shaped Ornaments of the Early Middle Kingdom. - In: Bulletin of the Egyptological Seminar - BES 19. - 2015. - pp. 117 - 130. A disc-shaped ornament from tomb 2108 in Sedment that dates to the late First Intermediate Period/early Middle Kingdom is kept in the Ashmolean Museum, Oxford. It is made of copper with segment-shaped inlays of carnelian and blue and dark brown/black faience. It was identified as the main element of a headband by means of comparison with the contemporary funerary mask of Khety from Asyut, which has the same arrangement of segmented inlays. 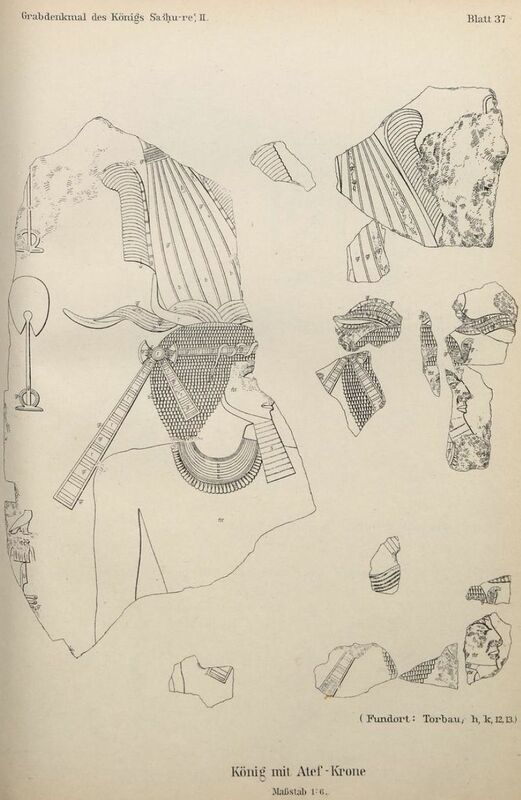 An overview and discussion of existing masks in Egypt is included in the article. Only funerary masks from Asyut seem to possess this feature, although the sample is relatively small. Zahi A. Hawass : A Burial With an Unusual Plaster Mask in the Western Cemetery of Khufu's Pyramid. - In: The Followers of Horus - Studies Dedicated to Michael Allen Hoffman. - Oxford : Oxbow Books, 1992. - pp. 327 - 336. - [PDF - 8,6 MB]. The author discusses a fine Old Kingdom plaster mask found during excavations at the Western Cemetery of the Cheops pyramid (tomb G5520). These excavations were carried out as part of a wider plan for the Giza plateau, the phases of which are exposed here. The mask belonged to a young woman, whose body was found intact and covered with a thin layer of mud. Around the top of the head a copper headband, covered with thin gold leaf and faience beads, was discovered. The woman's teeth were found beside the head, broken into small pieces. This indicates that the teeth had been removed before the plaster was applied to the face. To judge from the pottery found near the tomb shaft the mask should be dated to end of the 4th Dynasty. The mask may fulfil the same function as the reserve heads. It also served to preserve the skeleton, and represents a stage in the process leading to the full mummification of non-royal bodies. Very interesting. Thanks. I'm looking into the evolution of the ssd headband into the elaborate diadem of Amenhotep3, through the nineteenth dynasty (the clearest example being the Tutankhamen diadem. I have to admit, I do not know exactly what you mean... Is your question about the development of the headband (a white linen strip, presumably as a symbol of tribal chief) from Predynastic / Earlydynastic Period to the 18th / 19th Dynasty, or about the look in image, statue and as jewelery object only during 18th / 19th Dynasty? Sorry for being vague. In her book, The Crowns Of Pharoah, pgs 62-64, Sandra Collier states that the ssd headband evolved into the ornate headbands worn by pharaoh in the 18-19 dynasties. I'm trying to see if there's evidence that this means that the ornate diadems of the eighteenth dynasty are stylized representations of this early headband and what that may indicate about the meaning of the diadem itself, since all royal headgear had symbolic significance. My question is could these diadem be the evolved sśd headband, see Sandra Collier "The Crowns of Pharaoh" page 62-64? ... My question is could these diadem be the evolved sśd headband, see Sandra Collier "The Crowns of Pharaoh" page 62-64? Very interesting! Thank you, Lutz.